In today’s Blog Tips post, we’re focusing on growing your email list and creating incentives/content upgrades which will help you grow your list. Ahh… “the list.” Okay, first, let’s talk about the importance of growing your email list. 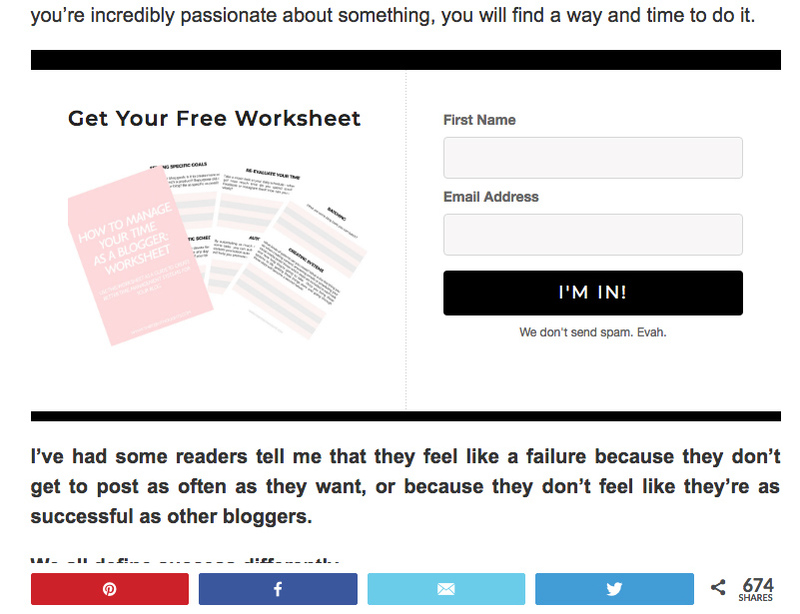 Why is an email list a must for any blogger and biz owner? 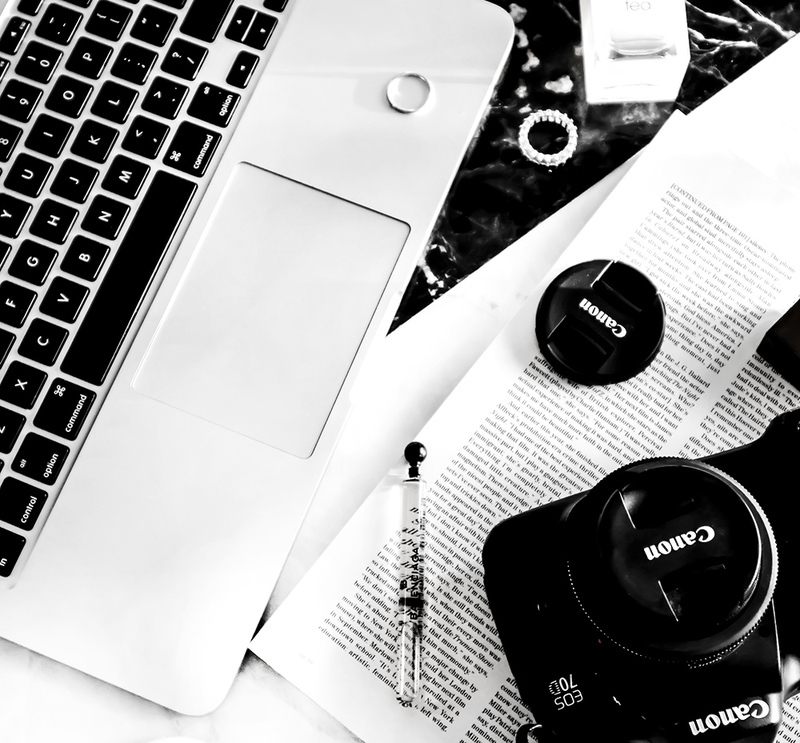 If you’ve been blogging for a while, then you know that some years ago, before the huge rise and growth of social media and blogging itself, it was easier to get people’s attention and get them to visit and read your blog. These days, with constant algorithm changes, getting your content seen and noticed isn’t as simple (or easy). You cannot control outlets like Instagram, Facebook or Twitter- your email list, on the other hand, is something you have complete control over (just like your WordPress blog). It allows you to connect with your audience + build strong relationships. Unlike with social media platforms, you have complete control over your email list. Email marketing has higher conversion rates than social media campaigns. Email is targeted- you can group your subscribers based on their interests and only reach out to them with content and products they’re interested in. Since I decided to focus on my email list and switch to ConvertKit, I’ve been getting a ton of questions from you guys. 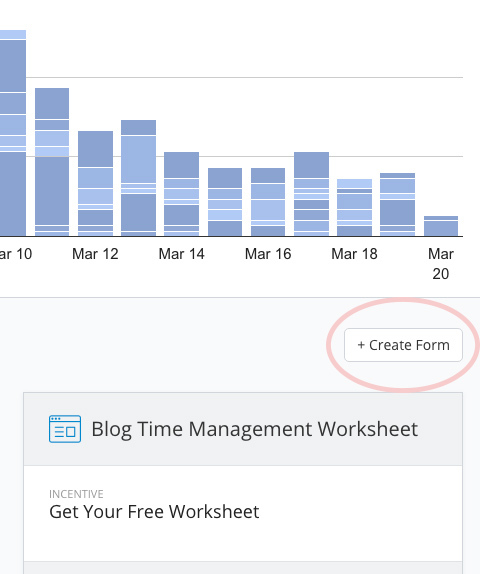 Like, how to add opt-in forms to your pages or how to add content upgrades and embedded the forms into your blog posts. Well, today we’re answering all these questions. SO…CONTENT UPGRADES- WHAT ARE THEY? They’re upgrades to your blog posts which you give away for free in exchange for an email address. Pretty simple right? Content upgrades are great for growing your email list. I mean, who doesn’t love a good freebie, amirite? 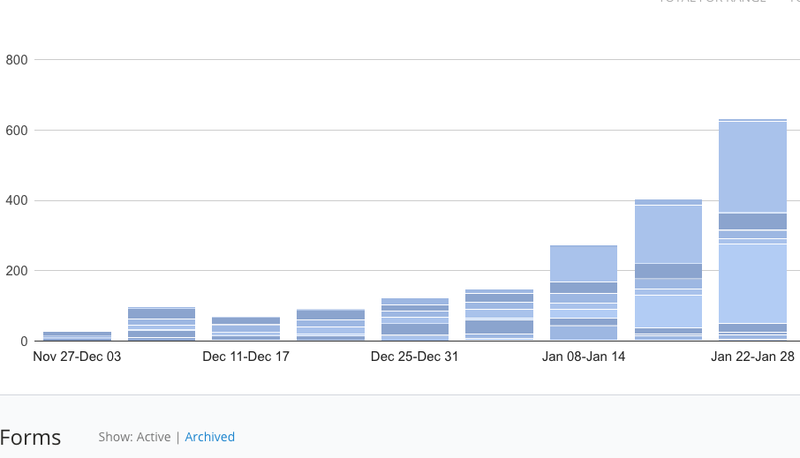 Ever since I switched to ConvertKit and began implementing content upgrades all over my blog, my list went from being stagnant to suddenly growing by as many as 1,000 new subscribers in two weeks. I switched to ConvertKit around August and that’s when I began creating content upgrades for my blog posts. I noticed a huge spike in January, which was when I published a post titled “7 Reasons to Start a Blog + Free Email Course” and my free 7-Day Start a Blog Course went live. Sometimes, you go through a bit of a trial and error, to see what kind of incentives do best. 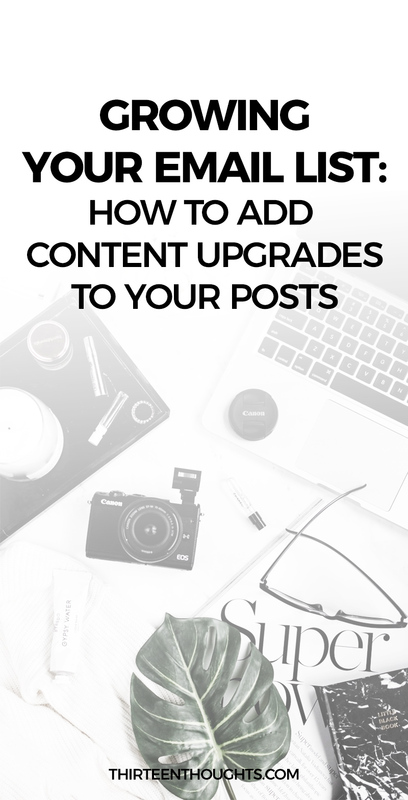 Regardless of what you blog about- whether it be beauty, cooking, parenting, traveling, wellness- there are endless things you can give away as content upgrades. There are so many other options, but you do have to remember that your incentive or content upgrade should relate to the article you’ll be adding it to, and it also should relate to your niche. This is a fun part! A great place to start with content upgrades is by going through some of your most popular posts. 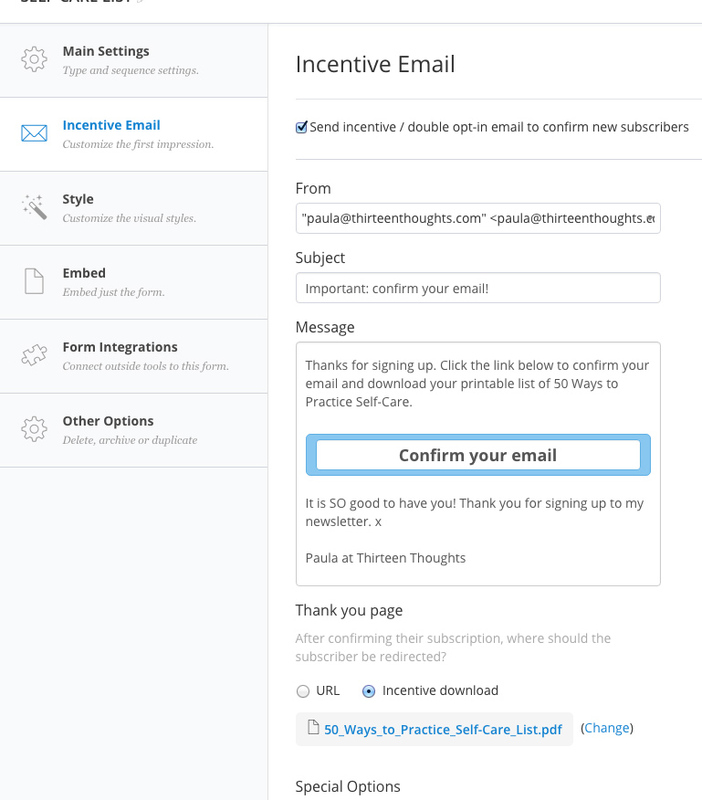 To give you an example, one of the first content upgrades I’ve created was for my 50 Ways to Practice Self-Care post, which also happens to be one of my most popular posts. Despite it being published years ago, it still continues to bring me thousands of views from Pinterest, every single week. Why wouldn’t I want to convert those new visitors into subscribers and regular readers? While going through some of those posts, ask yourself: how could I make this post better, by giving away a free content upgrade? For my Self-Care post, the answer was pretty obvious: create a printable list of those “50 Ways to Practice Self-Care.” I then changed the title in my post to include “+ a Free Printable!” and shared it again on my social media platforms. Remember though, that if you’re changing your title in a post that’s already popular, do not alter the URL! Even if you feel like you’ve said everything in your post and worked really hard on it, there’s always a way to add a little more value to your posts. You can create a worksheet that works well with your post, a short checklist, or add some bonus content. Take some time when deciding on your content upgrades- think of something your audience/readers will really like and something that will add even more value to your content, something that will help your readers solve a problem, save time, etc. It pays off to get creative with these, so spend some time brainstorming ideas. The easiest content upgrades you can create come in a PDF form. You can create them in Word or Pages if you’re on a Mac, and then simply save your file as PDF and upload it to ConvertKit (I’ll walk you through this in a minute). You can also use PicMonkey or Photoshop (which is what I use) to create pretty printables, lists, worksheets. Some upgrades can be as simple to create as writing an email. For example, you can create a content upgrade for your blog in a form of a free 5-day email course. In that case, all you have to do is write up your emails and set them up so that they automatically go out over the span of 5 days (you can do this right in ConvertKit, too by creating a 5-day sequence, then adding a form and embedding it in your post). Out of all my content upgrades, I’ve had the most success with my Free 7-Day Start a Blog Email Course. To create it, I’ve used the knowledge I already had, I collected information from some content I’ve already published (like growing your blog, setting it up, working on your traffic, importance of an email list) and neatly organized everything in one place, I wrote 7 Emails + a followup email and set up an email sequence in ConvertKit so that the course takes place over the 7 days. Not only did this already help me grow my list by nearly 1k subscribers, but I also connected with so many new blogging friends! I’ve had people email me and tell me that this free email course was more informative and helpful than some paid courses that are out there, and that, I have to say feels incredibly rewarding. There really isn’t anything else that compares and it’s one of the things I love most about blogging. 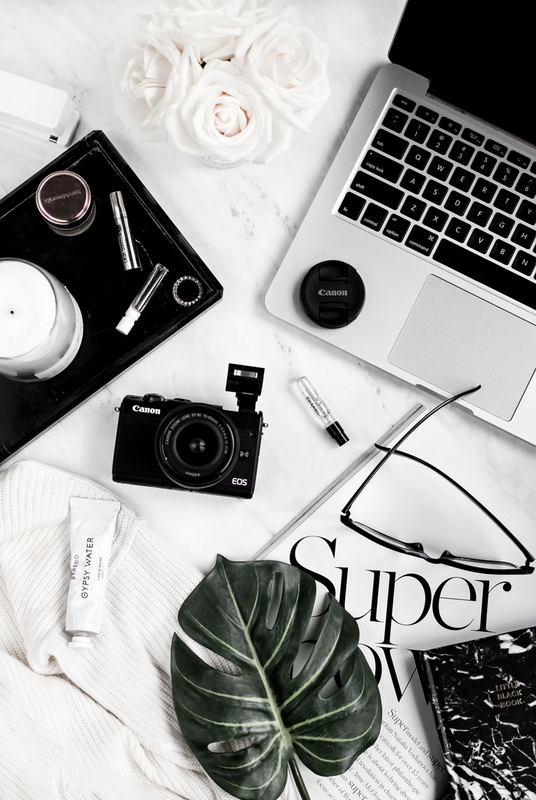 So yes, the point here is to grow your list, to monetize your blog, but know that when you really provide your audience with value, they will stick around. By providing value, you not only build relationships with people, but you also build trust. Okay, so now that you’ve decided on what kind of content upgrade you want to create for your particular blog post, it’s time to set it up in ConvertKit. 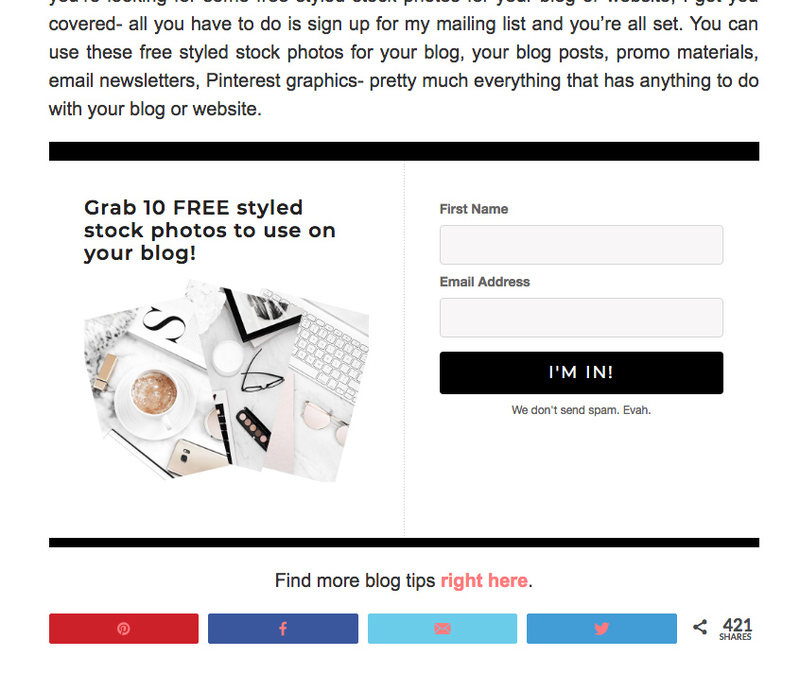 ConvertKit is an email marketing tool created for bloggers, by bloggers. This means that it comes with so many great tools, I honestly can’t imagine going back to using anything different. 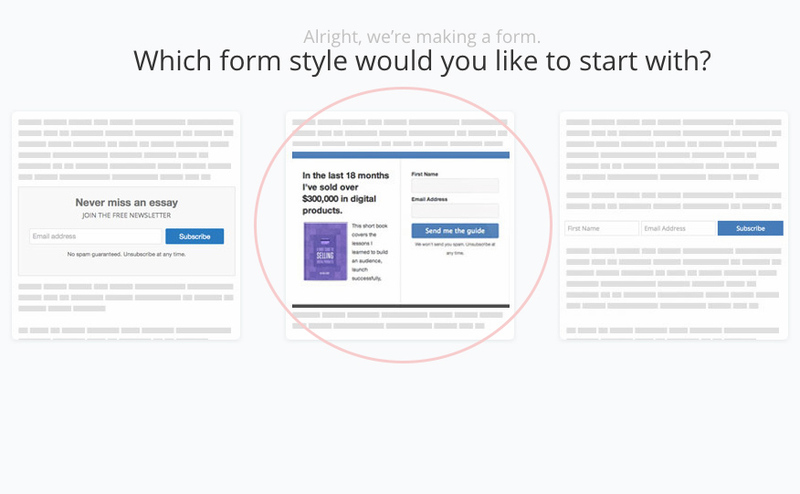 ConvertKit will ask you whether you want to create a landing page or a form, we will go with form. Then, you can pick what kind of form you would like to create. Since we’ll be creating content upgrades for our posts, we will the one in the middle, since we also want to add our incentive to it and make it look more inviting. You can pick between 3 different styles, if you’re adding a content upgrade to one of your posts, I highly recommend going with the second option. Okay, this is what your form will look like when just starting out. You can easily edit any text by placing your cursor on it- it is SO easy to customize your form. You can also change colors to match your branding style under the STYLES option. You can also create an image of your content upgrade and drag and drop it into the gray box, so that you’re giving your subscribers a visual idea of what their freebie will look like. It also makes the form look a little more inviting. You can see here that I added three images to my form, this way when someone wants to grab my free stock photos to use on their blog, they have an idea of what style the photos are. This is another example of my content upgrades: here I added an image of the worksheets I included in this post. It shows a little preview of what’s to come once someone joins my mailing list. Once you’re done editing the look of your form, you can finally upload your incentive. To do that you’ll go to your form’s settings > incentive email > check “incentive download” and upload your PDF document. Once you embed your form on your blog and once a new visitor confirms their email address, the freebie you uploaded will automatically begin to download. It’s that easy. Here’s what your settings will look like once you upload your incentive/content upgrade. Another cool thing about ConvertKit is that if you make a change to any of your forms, it will update all throughout your blog, automatically. 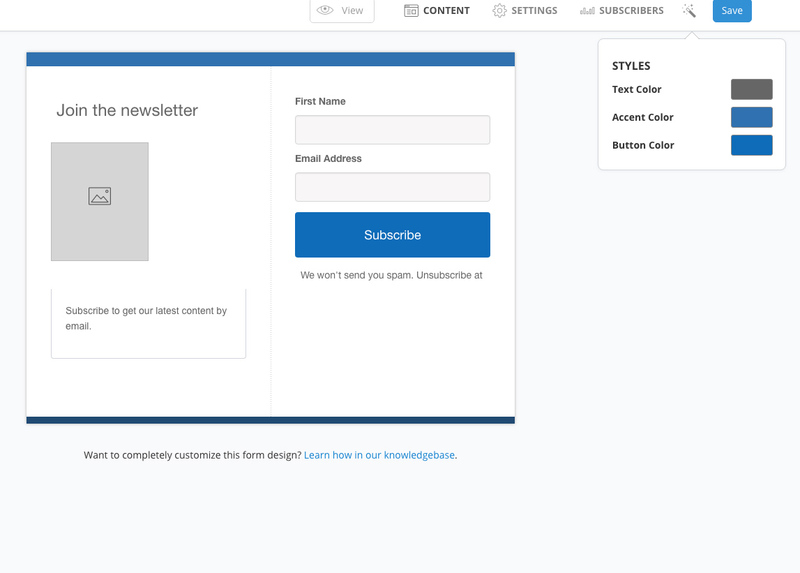 Embedding your form is also very easy, especially with the ConvertKit plugin for WordPress. It allows you to easily insert your content upgrade directly in the body of your post. With their plugin, you can also easily display the same forms in your side widget, your header, etc. The only thing you have to make sure when doing that is that your theme is compatible with the plugin. You can get a free ConvertKit trial right here. Can you think of any content upgrade ideas for your own blog? What content do you plan on updating? Remeber to focus on quality and provide your audience with value- then watch your list grow! I think that now more than ever, having a strong email list is important for any blogger who does or plans to monetize their blog.